Justice is a slippery term. It can be used, from one point of view or another, to describe almost any conclusion regarding moral rightness. How the scales of justice are balanced often depends on the weights placed upon them, and this is in most ways a subjective affair. These weights may come in the form of such concepts as fairness, retribution, restoration and redistribution, or more cynically in realities such as greed and self-interest. I cannot hope to outline a comprehensive or even convincing treatise of justice in this post, though sharing a few thoughts may be in order. From a Christian perspective justice finds its definitive bearing in God. How to understand God is, however, not an easy task given both his transcendence and our interpretative horizons and limits. Which commands of God are just? All of them? If so is a directive to genocide, such as those in the Old Testament, to be considered just? Does our ability as humans to obey such commands affect what is commanded of us by God? More basically, does justice exist as an objective and timeless concept, or does it come into play when God commands something? An illustration might be the question of whether helping the poor is God’s will because it is objectively just, or whether it is “just” simply because it is God’s will. Answer these questions I cannot. In many ways their answers are unknowable and unnecessary; perhaps, for the people of God, an ontological understanding of justice is not as important as a practical or embodied understanding of justice. Cutting to the chase, my view is that justice is made known to humans covenantally. What I mean by this is that justice is best defined not in objective and rational terms, but in subjective and relational terms – we best understand justice in our connection to others, most importantly God. When we are in covenant with God, as the Israelites discovered most poignantly in the Exodus story, we understand the love of God for us and others, and also his hatred toward sin; these important divine characteristics, among others, define the terms of our engagement with God and other people. When we are in covenant with others we realise our interdependence and deep need for human connection; suddenly the best outcome for others leads to the best outcome for us and vice versa, since we are all bound up together in life on this little planet. When we are in covenant with the earth and other creatures we necessarily realise that we are utterly dependent on creation to provide our basic needs. We are bound together, and what is best for creation is best for us. Much more could be said of course. But what arises is that justice is not so much about the rigid enforcement of self-evident propositional moral truths (since many of these are ever-changing in history), but about a course of thought and action that brings about goodness and flourishing for all involved; God, humans, animals, earth. Does that mean justice and/or injustice do not exist prior to the declaration of covenant? No, since God wills goodness for all creation prior to human existence, and creation can suffer evil independently of covenant; God judges good and evil distinct from our understanding of it according to his character. The point is not that covenant creates justice, but that covenant reveals justice to us who would be largely blind to the divine will without it. To go back to the marriage analogy: love and flourishing is best expressed between two humans who are deeply committed and connected to one another – without such “covenant” the knowledge of what is “just” for the other is limited, even blind. This is not to deny that certain moral standards are unchanging, but simply to say that they are perhaps unchanging because they lead to flourishing in almost every conceivable circumstance (I think of the command to not murder, or to not commit adultery). This approach to justice may well have the capacity to deal with the seemingly shifting morality of God in the Bible in different historical situations. 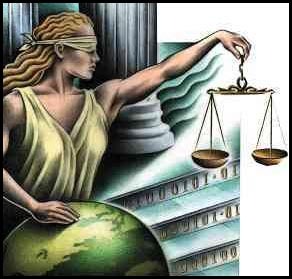 It also places higher value on the connectedness of God to creation, including humans, and esteems the concept of God’s transformational presence (Lady Justice’s blindness is revealed as being an obstruction to justice, since God’s justice is biased). Additionally it allows God to be sovereign and free in the midst of the infinitely complex narrative that is history. This approach provides a framework to understand Christ’s suffering and death in terms of justice, since God binds himself to the lowly and stands against the powers in their stead. Lastly it insists that, in a world where social justice has become “cool”, and where people from all sorts of backgrounds seek to work towards it, God remains an indispensable part of the process of justice for the Christian, as does suffering. Those who do not acknowledge covenant with God glimpse justice since they are made in his image, though it may not be comprehensively revealed. I’m sure there are many holes in these loose thoughts, but I would love to explore this proposal and learn with you in the comments section, particularly in terms of its practical implications. * To borrow terminology from Miroslav Volf, Exclusion and Embrace, (Nashville: Abingdon Press, 1996). Posted on August 15, 2011, in Advocacy, Biblical Studies, Theology and tagged Bible, Covenant, Fairness, Justice, Morality, Redistribution, Restoration, Retribution, TEAR, TEAR Australia. Bookmark the permalink. 5 Comments. Very interesting concept of justice Matt. When God calls for justice, as he does throughout the bible, what is the actual definition of this word? Or are there in fact many meanings that we have, through incomprehensive translation, placed under one umbrella word in English? This wasn’t rhetorical or anything, haha. I’ve been thinking and searching to find what justice actually means. It seems to be a pretty big idea throughout the scriptures and if thats the case then i guess it would have to be pretty important, hence i really want to know more about this. I see that justice and righteousness are used interchangeably and i am seeking to understand why, and what the word means. The idea of justice i hear most commonly seems to refer to retribution and even revenge. That to me doesn’t line up with what the scriptures are saying. There are other understandings of this word that i am reluctant to accept. I really like the idea you you have put forth. I guess what i am asking is, what does the original hebrew or greek or whatever other language of the original texts say about this? “The point is not that covenant creates justice, but that covenant reveals justice to us”. This is a great point, Matt! The beauty of Wright’s position is that it critiques both the conservative side of Christianity (for accepting the resurrection but not recognising the incredible responsibility that this revolutionary act bestows to us in terms of challenging anti-kingdom forces in the world) as well as the more ‘liberal’ (and I do hate to use that word) social-gospel (which, by sometimes denying the resurrection of Jesus, does away with its very foundation for such action in the world). And I guess this is where your ideas above come in. God’s justice is some kind of objective reality in a sense, but can only be understood (fully, at any rate) in covenant relationship. Wendell Berry says that traditional societies understood justice as the ability of the members of the society to answer their callings. I like that idea, because it looks beyond just feeding people or giving them safety, to something healthy, whole, worthwhile. And it points to a relational economy where no one is without work or vocation. I think all of these words need to be understood relationally and situationally – which is to say, concretely rather than in the abstract. Which is why I like where you end up. Thanks for that Simon, it seems very congruent with what Michael Northcott says about the different ethical paradigms of developed and developing nations; developed societies tend to favour an approach based on utility, costed by means of supply and demand, developing countries tend to favour a principled approach to justice, rights and equity. This is not romanticise developing countries, but it does point out that justice for modern societies is a human construct. For societies not so affected by European moral philosophy there is something more non-negotiable about justice, something foundational, natural. This is, not coincidentally, in line with the major world religions.